IoT technologies have taken the world by storm, but their design, implementation, and deployment pose significant challenges which have to be taken care in the beginning to avoid complete failure of the system and collapse of the whole ecosystem. 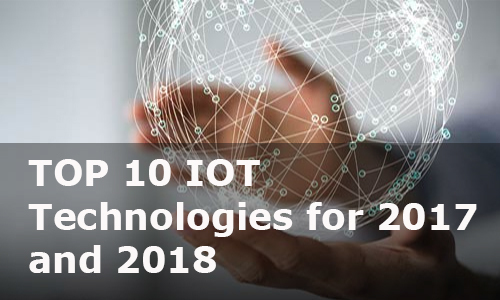 Gartner’s has released a list of Top 10 Internet of Things technologies 2017 & 2018 which can impact all IoT companies business propositions. IoT security is a major domain which will have an impact as these technologies are required to protect IoT devices and platforms from physical tampering and information attacks that attempt to encrypt devices communications and to address new challenges such as the impersonation of ‘things’ or denial-of-sleep attacks that drain batteries. IoT security will be complicated by the fact that many ‘things’ use simple processors and operating systems may not support sophisticated security approaches. IoT business models will exploit the information collected by ‘things’ in various ways like attempting to understand customer behavior, to deliver services and intercept business moments. As data volumes increase through 2021, the needs of the IoT may diverge further from traditional analytics and new analytic tools and algorithms will be required. Million of IoT “Things” will require tools capable of managing and monitoring them and generates thousands and perhaps even millions of devices. Management includes software updates, diagnostics, crash analysis and reporting, physical management and security management. Long-lived nontrivial “things” will require management and monitoring. This includes device monitoring, firmware and software updates, diagnostics, crash analysis and reporting, physical management, and security management. The IoT also brings new problems of scale to the management task. Tools must be capable of managing and monitoring thousands and perhaps even millions of devices. Low-power, short-range networks will dominate wireless IoT connectivity through 2025, outnumbering connections using wide-area IoT networks. However, commercial and technical trade-offs mean that many solutions will coexist with no single dominant winner and clusters around certain technologies, applications and vendor ecosystems will emerge. Traditional cellular networks don’t deliver a balanced combination of technical features and operational cost for those IoT applications that need wide-area coverage combined with relatively low bandwidth, good battery life, low hardware and operating cost, and high connection density. The first low-power wide-area networks (LPWANs) were based on proprietary technologies, but in the long term, emerging standards such as Narrowband IoT (NB-IoT) will likely dominate this space. Traditional operating systems such as Windows and iOS were not designed for IoT applications. Consequently, a new range of IoT-specific operating systems has been developed to suit different hardware footprints and feature needs. Some IoT applications will generate extremely high data rates that must be analyzed in real time. To address such requirements, distributed stream computing platforms (DSCPs) have emerged. IoT platforms bundle many of the infrastructure components of an IoT system into a single product. The services provided by such platforms fall into low-level device control, data acquisition, and application development. Standards and their associated APIs will be essential because IoT devices will need to interoperate and communicate and many IoT business models will rely on sharing data between multiple devices and organizations. Argus technologies offers Customized product design service which can be on turnkey basis or with limited involvement in the project. Our core expertise lies in area of Product Design, Electronic manufacturing, Embedded Software Development, PCB Layout Design Service, Contract manufacturing including prototype to production and highly specialized software development in embedded domain. This is interesting post. Can you send me more info about this theme? My email is: kolmas357786@gmail.com .